Monday night buffet for a birthday at Laputa Premium Buffet at Elizabeth Quay. At just under $70 a head, it’s no mac-and-cheese midweek dinner. The cuisine is Japanese and Chinese, and there’s an assortment of dishes to choose from. Sushi, roast duck, pork belly, sashimi, tempura – the kind of dishes you’d expect, are on all on the menu. The selection isn’t as extensive as the Epicurean but tastewise Laputa’s winning. The dishes were flavoursome, and not just because of the msg. They were well-executed. Freshly served the raw dishes, crisp the oily deep-fried goods; the sticky and sweet things balanced not cloying; the hot and spicy not overly searing on the tastebuds. The service is personal: on arrival, we had a staff member allocated to look after our table and the lady’s colleague gave us an overview of the restaurant and menu. Staff remained attentive throughout the evening. Finished plates disappeared quickly after they had appeared. Unprompted, serving staff asked about the desired portions of food before serving, which was welcome because who’d want to tuck into a big serving of roast duck and leave no space for much else(!). Hokkien fried noodles, karage chicken, sushi, yellow lotus bun, shanghai bun, braised beef, tempura lotus and tempura fish. Japanese cheesecake, mochi balls, small custard filled pastry. 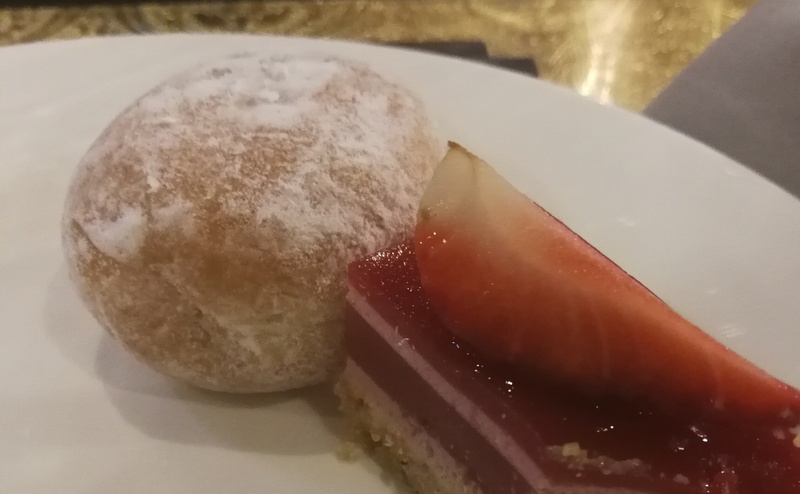 Strawberry cheesecake and a chocolate-stuffed French doughnut. Pistachio creme brulee, green tea cake, a coconut pastry, coconut and banana panacotta (surprising and my pick for dish of the day), tofu cheesecake, coconut pannacotta, a bean paste dessert, and orange panacotta. Roast duck, fried rice, fried squid, tempura veg, sushi, pork belly, tempanyaki salmon, pickled veg, raw beef and a fried flour ball of sorts. A steaming hotpot and an icebowl of raw seafood and meats for a DIY steamboat experience was also included. Taste verdict Great little addition to the Quay. Delicious food, good service and ambience, and very well-suited for a special occasion. Booking was essential; they were fully booked even on a Monday. I had mentioned during my phone booking that this was for a birthday and they delivered the birthday special, being a plate of three desserts (which could have been collected from the buffet itself) presented on a plate with ‘birthday’ piped in chocolate and a lighted candle. Only niggle is the two hour dining time limit, which was strictly enforced; the staff came over to remind us twenty minutes beforehand.